Don’t overlook the historical underpinnings of the modern day China-Italy connection. President Xi Jinping arrived in Italy today for a state visit, the first by a Chinese president in a decade. The landmark meeting may result in Italy becoming the first member of the G-7 to endorse China’s Belt and Road Initiative (BRI), a prospect raised by Italy’s Prime Minister Giuseppe Conte earlier this month. Such an outcome is highly unwelcome in the United States and some EU member states. While Italy maintains that its primary goal in borrowing infrastructure investment funding from China is to increase exports, there is an overlooked historical foundation between Beijing and Rome that fundamentally undergirds what many are only seeing as an impulsive economic partnership. Today, Xi Jinping begins his three-day Italy visit in Rome, when he is expected to sign a memorandum of understanding that would allow China and Italy to cooperate with the Asian Infrastructure Investment Bank for lending projects that are to focus on “infrastructure connectivity,” including the development of railroads, ports, civil aviation capabilities, telecommunications, and more. While BRI infrastructure funding projects have been the subject of significant international criticism, the inclusion of the AIIB in the agreement demonstrates a joint willingness between the two countries to foster a relationship that is compliant with EU standards. Despite the political brouhaha surrounding Italy’s decision, Rome and Beijing appear to be focused on their respective potential economic wins. Italy sits as an import connector between Europe and Africa and functions as a central node in BRI’s “EU Corridor,” which was announced in 2018. Chinese state media have described Italy’s port in Trieste as a gateway to Africa, and Italy, now in its third recession in a decade, stands to gain considerably in regard to trade production from international interconnectivity through the BRI. This mutual admiration is surging once again as Michele Geraci, undersecretary of the Italian Ministry of Economic Development, broadcasts what a “unique opportunity” Xi Jinping’s upcoming visit will be for #ItalyandChina (or #Xitaly). True, there is a unique opportunity now, but it’s one that has been maintained on and off for centuries. Italy and China’s economic and cultural exchange extends far back into antiquity. China’s ancient acknowledgement of two co-existing global centers of power, centered at Rome and the Chinese court, was a notion reinforced across centuries of western expansion and global modernization. Geraci continues this narrative in his claim that both nations share one very similar culture. This zeal for shared cultural heritage extends back to the original silk road and the intrepid merchants who braved it, a pivotal memory that both countries currently share to display the historical connections justifying their present deal-striking. Since the 1970s, official references to Italian explorer Marco Polo and the Ming dynasty voyager Zheng He have been employed in numerous official discourses as intercultural tokens of global connectivity, friendship, and peaceful development. It’s no accident that Beijing’s “China’s Peaceful Development Road” white paper, a rhetorical salvo paving the foundation of the BRI’s current architecture, coincided with the 750th and 600th anniversary celebrations of those two world explorers respectively. 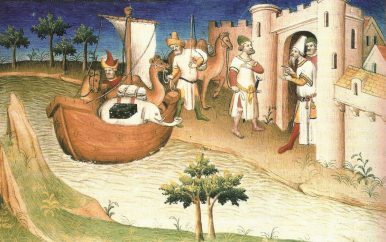 The voyage of the Venetian calls attention to the already existing subtle but strong intercultural ties, for which many had travelled and many more would (ambassadors, pilgrims, missionaries, merchants), overcoming the communicative system of a fragmented ancient world occupied by Rome and China, thereby anticipating the present moment, in which the immediacy of such contact has become a necessity. After the so-called “Second Silk Road Summit” in Rome, Xi will cap off his trip with a visit to Palermo. To most observers, this is a curious stop. But the visit is meant to intervene directly into the historical timeline of Italy and China’s cultural exchange. In 1225, Palermo was the site where a Chinese customs officer first recorded his detailed impressions of Italy, mentioning Sicily by name. It is telling that Xi has chosen to commemorate observations of an adventurous Chinese agent describing Italy on his own terms. Xi’s predecessors were more inclined to pay homage to Marco Polo in Venice, as President Li Xiannan did in 1987. But China arrives now with its own designs. Officials’ statements about their new relationship are rich with words like friendship, connectivity, exchange, and cooperation, terms suggesting reciprocation, equality, and balance between the two nations. However, trade is never conducted on an absolute leveled field. It appears now that voyagers and merchants from the east are in the position to direct the stories and to carry back to Beijing the wonders of the west. Dr. Kyle Anderson is the Director of Global Citizenship at Centre College and a specialist on Sino-Italian cultural and political relations. Logan Pauley is a China analyst, Scoville Fellow, and Pacific Forum Young Leader based in Washington D.C.
Xi’s receptions in Italy and France were markedly different. So were the benefits for the hosts – but not in the way you’d expect.